It will be a night of champions as three world title holders will be looking to defend their crowns this Saturday night in the Ford Center at The Star in Texas. Before these champions grace the boxing ring, the ESPN prospect of the year in 2018 and quite possibly a future world champion in his own right will be looking to keep his undefeated record intact. Teofimo Lopez (11-0, 9 KOs) is coming off a highlight reel level knockout win in his last bout against Mason Menard in the very first round. The knockout was seen all across the world as various networks could not stop showing the impressive stoppage win. He will no doubt be looking to make another statement this Saturday night. Lopez will be standing across the ring from his toughest opponent to date in Diego Magdaleno (31-2, 13 KOs). At age 32 Magdaleno has the opportunity to stop the hype train that is currently behind Lopez dead in its tracks. Defeating Lopez won’t be easy but he does have the experience advantage to give the young up and comer plenty of issues. Magdaleno is after all a two time title challenger, losing both of his chances at gold against Roman Martinez in 2013 and Terry Flanagan in 2015. Although he came up short in those contests the thought is that he can use those experiences to overcome the very dangerous but also inexperienced Teofimo Lopez come Saturday night. If Lopez plans to one day soon fight for a Lightweight title then he will need to dispatch of Magdaleno in impressive fashion. Speaking of Lightweight titles both Richard Commey (27-2, 24 KOs) and Isa Chaniev (13-1, 6 KOs) will be battling it out for the vacant IBF Lightweight title on the card as well. For Commey this will be his second crack at a world title as he fought former champion Robert Easter Jr to a split decision loss back in 2016. Following that loss Commey again lost another close decision this time at the hands of Denis Shafikov. Since those defeats Commey has bounced back in a big way winning three bouts in a row with two of those wins coming by stoppage. Commey has shown to be a devastating puncher throughout his career and will need every ounce of that power when he battles Isa Chaniev. Although he isn’t well known Chaniev is a resilient boxer and one that has upset the applecart before. He has only lost one time in his career in 2017 against Fedor Papazov. Since then he has rattled off three straight victories which has placed him in the position he is in today battling for a world title. As those Commey and Chaniev battle to get their first world title, Oscar Valdez (24-0, 19 KOs) will be making the fifth defense of his WBO Featherweight world title. This will be the first time we will be seeing Valdez in the ring since his fight of the year candidate bout against Scott Quigg in March last year. Although Valdez managed to bring him the victory in that bout it cost him a hefty price as he suffered a broken jaw and has since been out of action for 11 months. He won’t be exactly taking on a soft touch in his first fight back as he will be matched up against the undefeated Carmine Tommasone (19-0, 5 KOs). For Tommasone this is an opportunity of a life time. He won’t be given much of a shot to win but he is a good boxer that has fought respectable opposition. Tommasone has also picked up several smaller regional titles such as the EBU Featherweight title and the WBA Inter-Continental title as well. This will be his first shot at a world title and will be looking to take full advantage of this moment. Headlining the card will be a rematch between former unified Light Heavyweight champion Sergey Kovalev (32-3-1, 28 KOs) and the man that unseated him last year for his WBO crown Eleider Alvarez (24-0, 12 KOs). In the their first contest it was Kovalev who seemed to be in control for much of the fight, landing plenty of hard shots and keeping his opponent off balance. To Alvarez credit however he never was truly hurt and kept pressing forward. Kovalev has stopped plenty of his opponents with those same shots he was hitting Alvarez with but he would not be deterred. In round seven Alvarez was rewarded for his ability to keep pressing forward when he scored a trio of knockdowns. The first shot was an overhand right landed by Alvarez to the temple of Kovalev that took his legs away and knocked him down the mat. The second knockdown occurred when Alvarez landed a combination upstairs with a left hook followed by a right hand that saw Kovalev again hit the mat. The third and final knockdown was an overhand right followed by a left upper cut which saw Kovalev crumple again to the floor which forced the referee to stop the fight again. After the fight it was revealed that Kovalev was winning on all three scorecards at the time of the stoppage. Both men have been on record saying that the rematch will play out much differently. 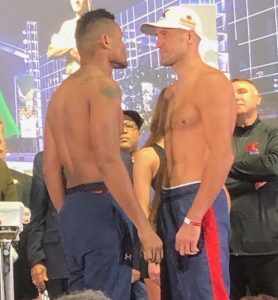 Will Kovalev be able to regain his world title that was snatched away from him and prove that he is still a major player in the division or will Alvarez win in more emphatic fashion this time around? We will all get the answers to these questions come Saturday night.